GAINESVILLE, Fla. — The University of Florida hired a public relations firm and launched a statewide media blitz, defending its blueberry program in the wake of an I-Team report revealing the taxpayer-funded university's controversial deals with Mexican farms. The public relations campaign comes after I-Team Investigator Kylie McGivern uncovered UF develops new types of blueberries -- a program designed to help Florida's farmers -- and then made millions of dollars by selling the rights to grow those blueberries to the foreign competition, including farms in Mexico. UF blasted out a press release to nearly 250 media organizations last week, promoting how its blueberry breeding program helps Florida growers stay competitive in the global market. But local growers have accused the university of helping the competition by selling the rights to grow its blueberries in foreign countries that import to the U.S. during Florida's picking season. 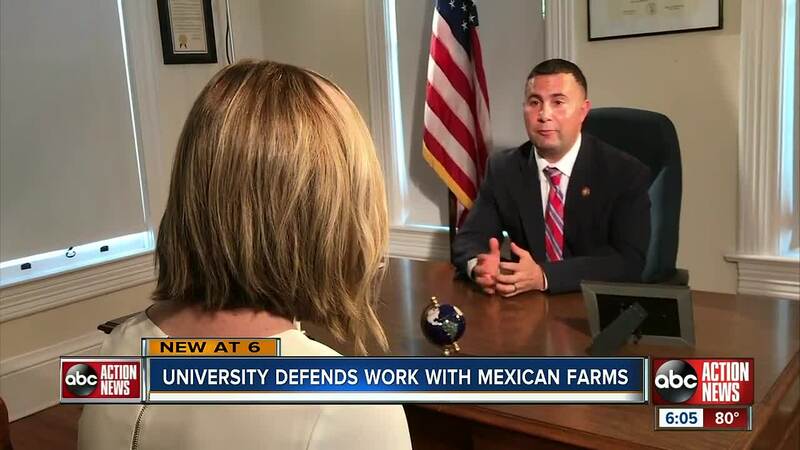 U.S Rep. Darren Soto, D-Kissimmee, is demanding changes to protect Florida's farmers after watching the I-Team's reports. "We wanted to make sure -- after ABC did this story, locally -- that we were meeting with UF to work on these concerns," said Soto. “Obviously, I was very concerned about us developing blueberries that then will be utilized in great measure to compete with the very local blueberry farmers we’re seeking to protect." The I-Team also discovered UF's Institute of Food and Agricultural Sciences, which oversees the blueberry breeding program, signed a contract two weeks ago to hire a public relations firm. The publicly-funded university will pay California-based Meltwater $3,500 over a one-year period, according to the contract obtained by the I-Team. A spokesman said the university is paying Meltwater, "to monitor news coverage and send news releases." A university spokesman said the recently signed agreement is a contract renewal with Meltwater. The university also maintains more than one in-house public relations office. Soto told the I-Team he wants an import ban on all foreign-grown UF blueberries during Florida's picking season. "We’d like to get the best deal for our blueberry growers we could here in Florida," said Soto. In response to the I-Team's reports, the university has said they are working to protect the interests of Florida farmers. But according to their own accounts, UF only bans some blueberry imports from Peru -- and not Florida's biggest competitor, Mexico.